To begin with Rajkumar Hirani’s ‘PK’ bears a sharp resemblance to the Umesh Shukla film ‘Oh My God’ that starred Paresh Rawal. While the narrative of ‘Oh My God’ was more from the perspective of a common man, Rajkumar Hirani resorts to a more funny way in exposing the hypocrisy that exists around the concept of religion in India. He brings in a human-like alien aka PK (drunkard) (Aamir Khan) who is reprimanded, ridiculed and often misunderstood, owing to his innocent sense of asking questions in his tryst to find his lost remote control that shall help him go back to his home. Rajkumar Hirani cleverly infuses humour and wit in his trademark style and truly justifies his point through PK that one needs an alien, an absolute outsider, from another world, someone who dresses just like humans, to make people realise the prejudices and the blind faith associated with religion and self-proclaimed godmen. But even PK gets caught in a web and is confused owing to the differences that exist in the name of religion. PK meets Jaggu aka Jagat Janani (Anushka Sharma) who is also forced into following the beliefs of Godman Tapasvi Maharaj (Saurabh Shukla). Together, they embark on a journey to expose the misconceptions associated with religion. 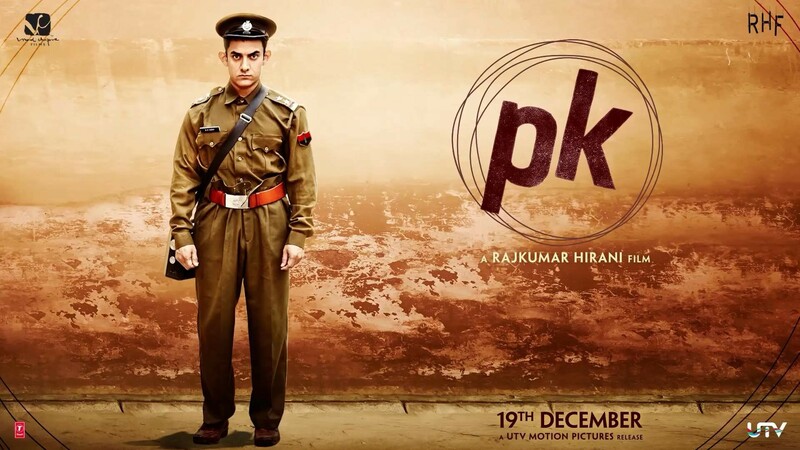 Several hilarious situations laden with razor-sharp dialogues, which often take a sarcastic dig at society, make PK an interesting watch. While Rajkumar Hirani follows a narrative similar to his previous films, at no point of time does one feel that things are getting a tad too repetitive. Except the second-half when the romantic track between PK and Jaggu seems entirely unnecessary and hinders the narrative. Even the climax, after a brilliant first-half, seems way too detached from the main plot as it revolves around the personal story of Jaggu, more than the bigger concerns of society. Although, the track manages to come back on track, these scenes seem like speed breakers in an otherwise tight film. Rajkumar Hirani has always been simple in his approach to making films, even while tackling the most difficult subjects. Be it ‘3 Idiots’ where he took a dig at the education system or ‘Lage Raho Munnabhai’. He maintains his same style in PK as well and one must admit that ‘PK’ certainly is more bold and challenging as it is not easy to please all the gods (Read censor board, various religious organisations). PK, by no means tries to delve into any particular religion. Rather it boldly delves into many diverse faiths, which will raise many questions. But Rajkumar Hirani deals the issue with an ease, not letting his intentions fade away. Aamir Khan as PK, in his second outing with Rajkumar Hirani, once again is the scene stealer. While his antics may come across as similar to his character in ‘Dhoom 3’, his over-expressive eyes and his ‘Satyamev Jayate’ style of questioning the society may seem a little too overboard, the innocence and the cuteness quotient of the character can’t be ignored. And this is where PK, the character, scores brownie points than the film. Anushka Sharma as Jaggu is good as a television reporter, although her pouted lips seem to get all the attention. Sushant Singh Rajput’s track seems unnecessary in the film. But the actor delivers his part seamlessly. Sanjay Dutt, in a small but important role, excels in his performance. While Boman Irani has been a forerunner in Rajkumar Hirani’s films, the actor’s role in PK is reduced to a brief role. However, in little screen time that he has, he manages to strike a chord. Saurabh Shukla as the godman is exceptionally brilliant. Additionally, a cameo by a rising superstar in the climax just adds to the star value of PK. Shantanu Moitra’s music takes time to build on. But it is as soothing and subtle as the film’s plot. However ‘Love is a waste of time’, is certainly a wasted song amidst the plot that hinders the narrative. Final Verdict: PK is a film that is thoroughly enjoyable. It has got a message which makes one think deeply. Well, it might not be as great as Rajkumar Hirani’s previous outings, but is certainly a film that will be remembered for its freshness and execution. Rajukumar Hirani once again proves a point that one doesn’t need a complex plot to keep the viewers engaged; a simple meal cooked the right way with a drink can do wonders. Recommended!